Our collection provides the complete run of Godey’s Lady’s Book, and is the only one containing the color plates as they originally appeared. These potato recipes appeared in the February 1867 issue of Godey’s Lady’s Book. BOILED POTATOES — There are really so many ways of even boiling potatoes that it is difficult to satisfy one’s mind which is the best, each being good, providing it is well done. The French, however, hold that by using too much water the flavor of the potatoes becomes seriously impaired; but it depends entirely upon the quality of the potatoes whether they are better done in their jackets or peeled: though towards the end of spring, when they get old, it is greatly preferable to pare them, as the skins then contain a narcotic property which gives the potatoes a strongly disagreeable flavor. In any case, potatoes should be boiled quickly, care being taken to choose them of an equal size, and cutting them in half when they are large. Rather small-sized potatoes are to be chosen in preference to those of overgrown proportions, and it is at all times in better taste to have potatoes rather underdone than boiled to pieces. The following is the most generally received method of boiling potatoes. Thoroughly wash and pare them, place them in a small saucepan with sufficient cold water to cover them, place them upon a clear fire, and bring them to a boil as speedily as possible. Good potatoes of a proper size will be done in about fifteen or twenty minutes after beginning to boil. Strain off the water and serve as soon as possible, without sprinkling salt over them, or adding any to the water in which they were cooked. One thing against the addition of salt is that careless cooks generally use it with such a heavy hand. Some housekeepers advocate placing the saucepan of potatoes over the fire again after the water has been poured away, but if the potatoes are done as they should be, this process, instead of being an improvement, only tends to give the potatoes a bad flavor. When intended to be mashed or converted into a made-dish, potatoes should invariably be boiled without salt being employed, as it deadens them both in flavor and quality; but for made-dishes generally potatoes are preferable steamed instead of boiled. POMMES DE TERRE EN CHEMISE — Potatoes served in this way are in the present day considered fashionable. Wash them carefully, and without paring them boil them quickly; when they are quite done, drain away the water and allow the saucepan to stand a few moments by the side of the fire for the potatoes to dry; get ready a damask napkin, made hot and folded in a dish, envelop the potatoes in it, and serve them immediately. Remember, of all vegetables, potatoes, particularly, require to be sent to table perfectly hot. 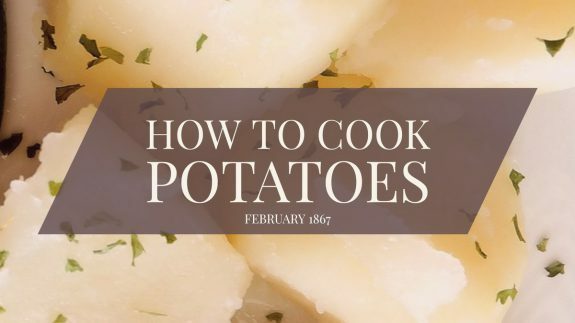 STEAMED POTATOES — Either peel them or not, according to their quality, but at any rate wash them thoroughly; put them into a steamer, cover them down closely, and place them over a saucepan of boiling water. Endeavor not to lift the lid until you have reason to suppose the potatoes are done. Unless of a very small size, potatoes usually require forty minutes’ or an hour’s steaming. BAKED POTATOES — Potatoes are either baked in their jackets or peeled; in either case they should not be exposed to a fierce heat, which is wasteful, inasmuch as thereby a great deal of the vegetable is scorched and rendered uneatable. They should be frequently turned while being baked, and kept from touching each other in the oven or dish. When done in their skins be particular to wash and brush them before baking them. If convenient, they may be baked in wood-ashes, or in a Dutch oven in front of the fire; serve them in damask napkin. When pared they should be baked in a dish, and fat of some kind added to prevent their outsides from becoming burnt; they are ordinarily baked thus as an accessory to baked meat. POMMES DE TERRE A LA DANOISE — Peel six good large mealy potatoes, cut them into rather thin slices, and throw them into a saucepan of boiling water, do them quickly until they are tender enough to mash; strain off the water and mash them smooth with a spoon, add some fresh butter or oil, salt, pepper, chopped parsley, and grated nutmeg, together with two new-laid eggs. Stir all well, heat some very good butter or salad oil in a frying-pan, place in it spoonfuls of the potato, turn them as they become brown, drain them from fat, and serve very hot. When preferred, spoonfuls may be arranged upon a buttered dish and baked.